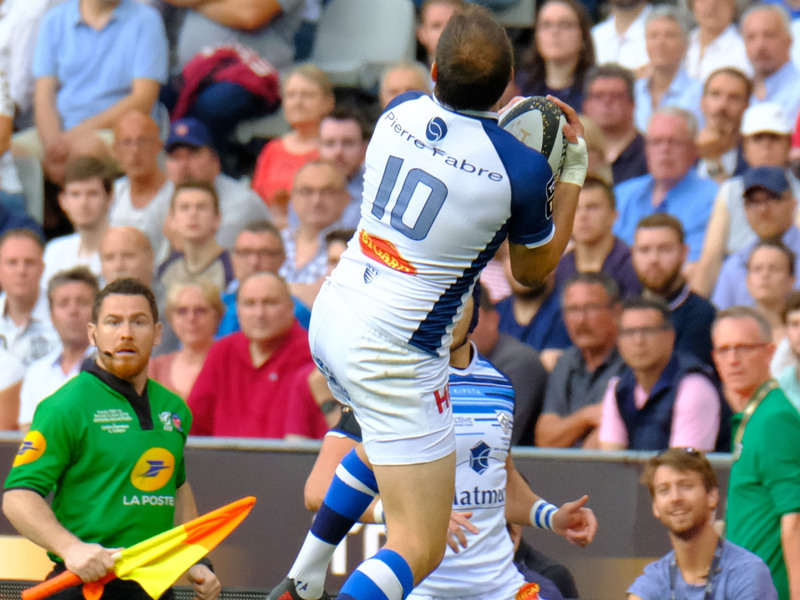 Defending Top 14 champions Castres provided a huge boost to their 2018/19 play-off ambitions following a fine 16-12 triumph over Bordeaux-Begles at the Stade Chaban-Delmas. It was an absolutely dire first half, which saw more spills than thrills, and it ended with the kickers dominating proceedings as Baptiste Serin scored two penalties to Benjamin Urdapilleta’s one. Matters improved slightly after the interval as Geoffrey Palis and Marc-Antoine Rallier touched down for the visitors, and that proved to be enough to secure a fine win, despite further three-pointers from Serin and Matthieu Jalibert for Bordeaux. With both sides in contention for the top-six going into the latter stages of the season, it was an unsurprisingly nervous affair. Despite conditions being perfect for attacking rugby neither team wanted to spread the ball too wide and, as a result, an awful contest ensued. Mistakes were prevalent and it was ultimately an abrasive match between the two packs. Castres initially had the upper hand, with Mathieu Babillot and Alex Tulou creating a couple of indents but, as the half wore on, Bordeaux number eight Afa Amosa began to make metres. Their scrum also took control and they deservedly edged the encounter going into the break as Serin kicked two successful penalties to take them three-points ahead. Urdapilleta’s effort was sandwiched in between those UBB scores, but they struggled to find their continuity before the break. However, they immediately improved in the second period as the visitors went through the phases and touched down via Palis. Although the hosts’ scrum-half regained their lead, Castres were on the front foot and, after Semi Radradra had been sin-binned, Rallier crossed the whitewash for a 13-9 advantage. Christophe Urios’ charges were in the ascendancy and went a long way to sealing the win when Rory Kockott kicked a superb long-range penalty. Jalibert did reduce the arrears in the latter stages, which gave UBB the losing bonus-point, but the champions held on for a crucial triumph. Castres went into third following that victory, but it was only brief as Lyon claimed a dominant 47-9 victory over soon-to-be relegated Perpignan. While the Catalans’ drop into ProD2 has not yet been confirmed, it is highly unlikely they will overturn their points deficit in the final four games. Christian Lanta’s men were comprehensively outplayed by the hosts as Dean Fourie, Mickael Ivaldi, Noa Nakaitaci, Carl Fearns, Virgile Lacombe and Toby Arnold all went over for Pierre Mignoni’s side. It was also a high-scoring affair at the Stade Marcel-Deflandre with La Rochelle completing a dominant 71-21 win over Pau. They were dominant throughout and touched down 10 times via Mathieu Tanguy, Gregor Alldritt, Kini Murimurivalu (twice), Ihaia West, Arthur Retiere (twice), Levani Botia, Thomas Berjon and Vincent Pelo. Meanwhile, Stade Francais remarkably overcame the loss of two players to red cards to overcome Agen 25-22 at the Stade Jean-Bouin. Sekou Macalou and Jonathan Danty were sent-off, but tries from Kylan Hamdaoui, Julien Arias and Gael Fickou saw them defeat their relegation-threatened opponents, who responded through Johann Sadie, Sam Vaka and Lucas Rubio. Grenoble benefited from Agen’s slip up in the race to avoid the relegation play-off as they beat 14-man Toulon 19-18 at the Stade des Alpes. They are now just two points behind Philippe Sella’s team after Lolagi Visinia’s try and 14 points from Gaetan Germain helped them overcome the visitors. Patrice Collazo’s side had Raphael Lakafia red carded but they looked set to take the spoils after Julian Savea and Daniel Ikpefan crossed the whitewash. However, Germain’s late penalty snatched the victory for the hosts.